Grace became part of our family in 2015 and had decent bottom paint on her during the survey. At the time, I was told she had just been painted, so I waited until this year to have her pulled again and to do some maintenance. In about a week, I leave for a 2 week stint around the San Juan Islands, so having a clean bottom and prop should help give me a speed boost for the longer trip. I also had a couple of smaller projects to complete before the trip. 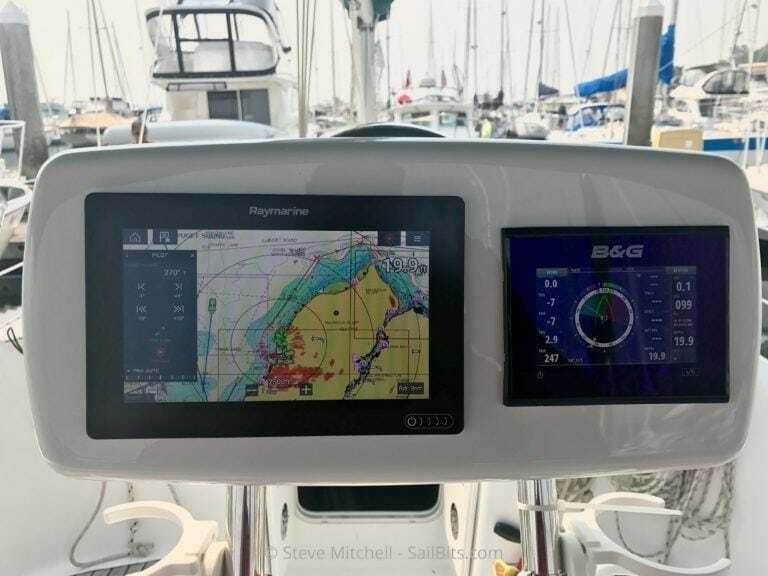 New NavPod with Raymarine Axiom 9″ and B&G Vulcan 5 MFDs. 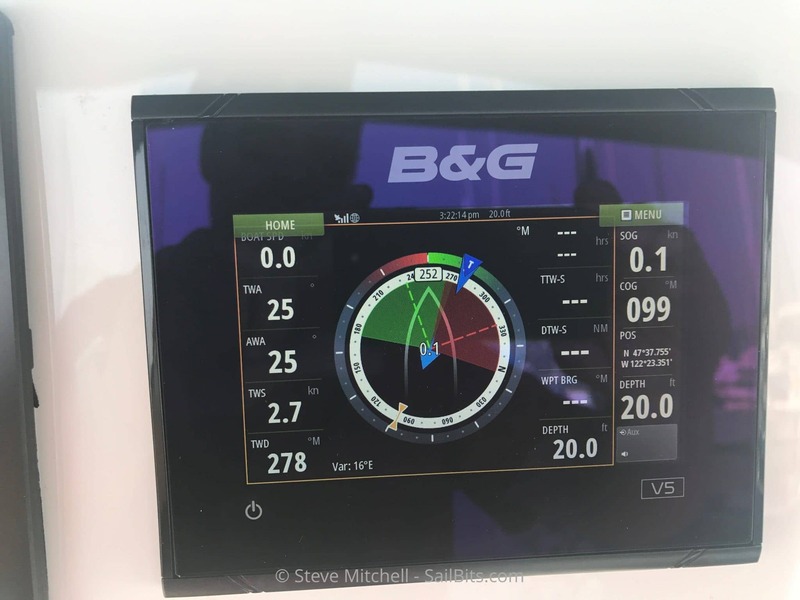 One of the most important projects to complete was installing the Raymarine Axiom 9″ chartplotter that I discussed here, and a new B&G Vulcan 5 chart plotter. 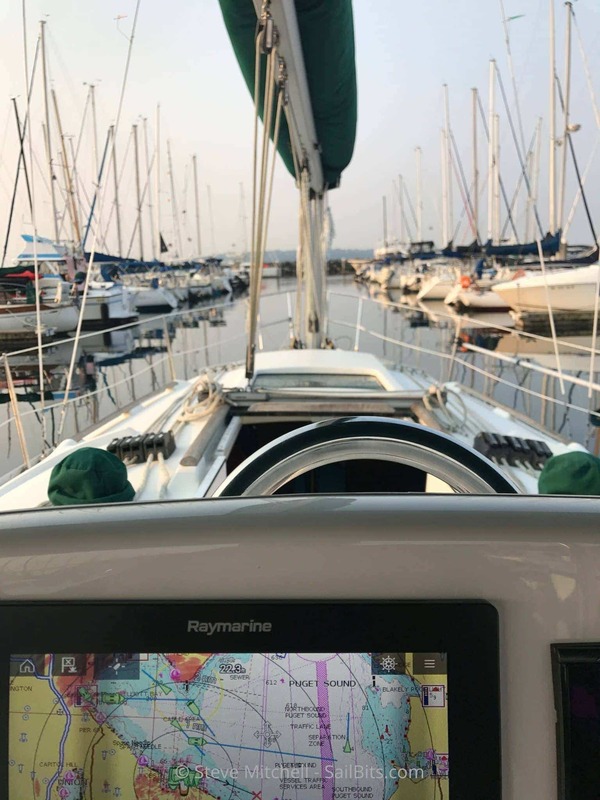 I had wanted to move up from the 7″ Raymarine es78 chartplotter I had installed for the last 2 years because of the smaller screen size, but was waiting for a few key features which came out in v3.1 of LightHouse for the Axiom, which I will be writing about in a separate post. Those came out recently, and after testing things for an evening sail with the Axiom temporarily mounted, it was time to make it permanent. The B&G Vulcan was of particular interest to me for a few reasons. First, it was super small yet still full featured for what I needed on a sailboat. It also has the vaunted SailSteer feature that I loved from Jammy and my B&G setup. It also can do software updates to my V50 / H50 B&G VHF radio, and interact with my Fusion radio, something v3.x of LightHouse has yet to support. I had ordered a new NavPod about the same time the Axiom came, and had to carve out a hole for the B&G, but other than that it was a pretty uneventful install. My older NavPod was not as tall, but was about the same width. This meant that I had to add a new tapped hole in the guard to mount the NavPod, but that was trivial. I moved over the LED light that is on the back for lighting up the cockpit, stuffed the wires through, and connected everything up. The only casualty of this move was the B&G H50 wireless handset, which had a permanent mount and charging cradle right on the NavPod. While I liked this for convenience, I had difficulties hearing it when sitting, and it took up a ton of space. I’m looking for alternatives as to where it should live. One of the other sorely needed updates was a new sail cover. The original was in bad shape when I bought the boat, and finally started flaking away to nothing from being in the sun too long. I had added snaps on the forward portion as the zipper had completely eroded! In addition, the boat had a weird lazy jack system that interfered with what felt like everything, and required someone futz around with it far too much while the sail was flopping around. I had a Doyle Stack Pack on Jammy, but I didn’t want something so intrusive that required the mainsail be modified. After some research and talking with friends who had similar setups, I chose the Doyle Cradle Cover. Essentially it is the same concept as the Stack Pack, a zippered mainsail cover with structure to keep it open and waiting for the sail, along with lazy jacks, but it is not connected to the mainsail and can be rolled up on the boom while using the sail, which I think looks better. The cradle cover provides much better sight forwards while in use. One side benefit I hadn’t thought of is the visibility forwards. I already love how much we can see since we do not have a dodger but without a sail cover hanging down under the boom, the Cradle Cover provides even more visibility forwards. Now I can see even more underneath the NavPod from my helm seat, and the folks on the cat bird back rail seats have a wonderfully unobstructed view. 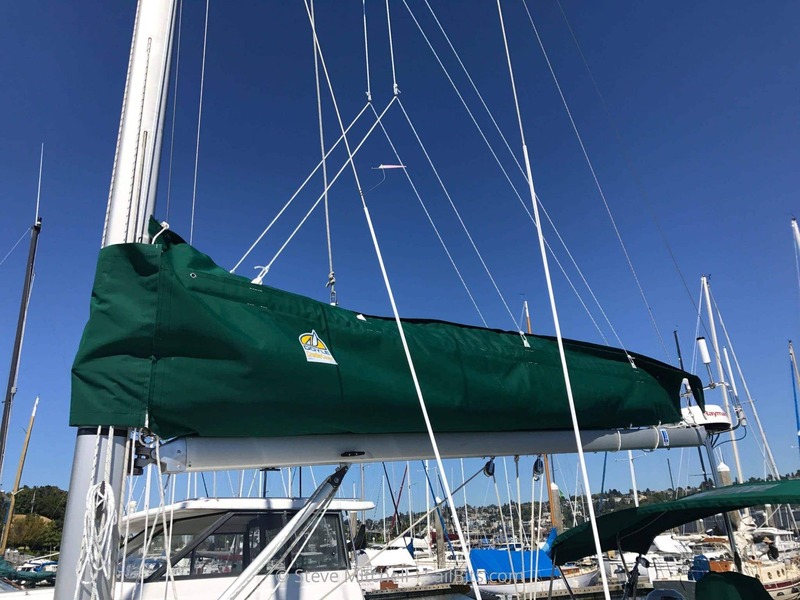 I’ve only used the cover a few times since install, but it is already a ton easier to raise and lower the mainsail – lowering in particular is a lot safer. 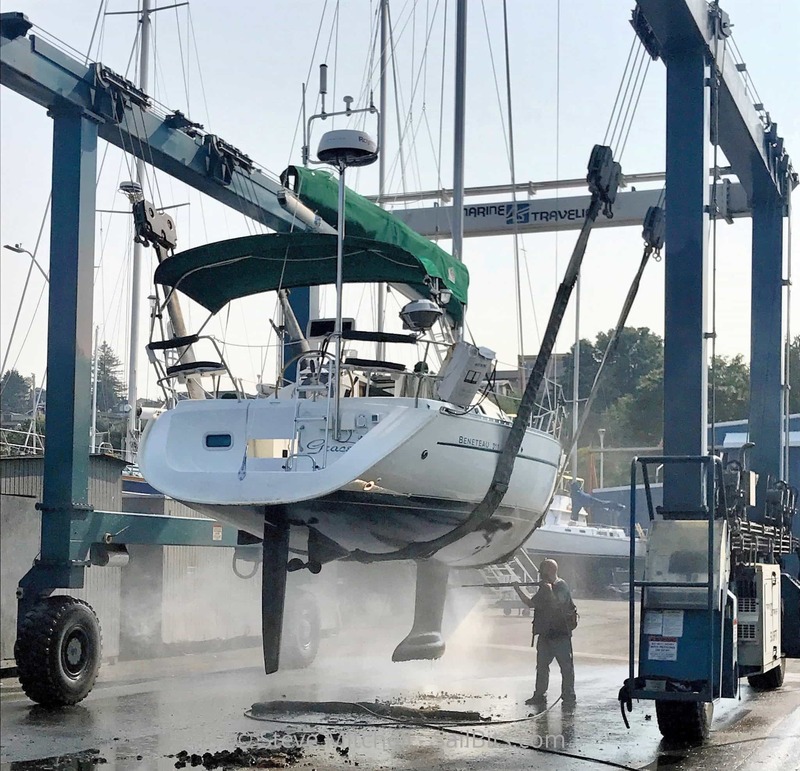 This model of Beneteau has a positively huge boom and mainsail, and we often have to reef when the wind gets up to 20 knots, so having the ability to drop things into a waiting sail “bag” adds not only convenience, but safety for the crew on the deck. I got up early on Tuesday to get Grace up to Seaview West to be hauled. The day started warm, as it has been the last several weeks, reaching the 90’s in Seattle – which is not usual for us. It also continued to be smoky from the lack of air flow and BC wild fires. The instruments all appeared to be working well, and I had pre-programmed a route in the new Axiom since it now supported my Evolution Autopilot, so off we went on the hour trip up around West Point. The motor was pretty uneventful, although at 8AM on a Tuesday, I had to dodge a lot of small boats out fishing. 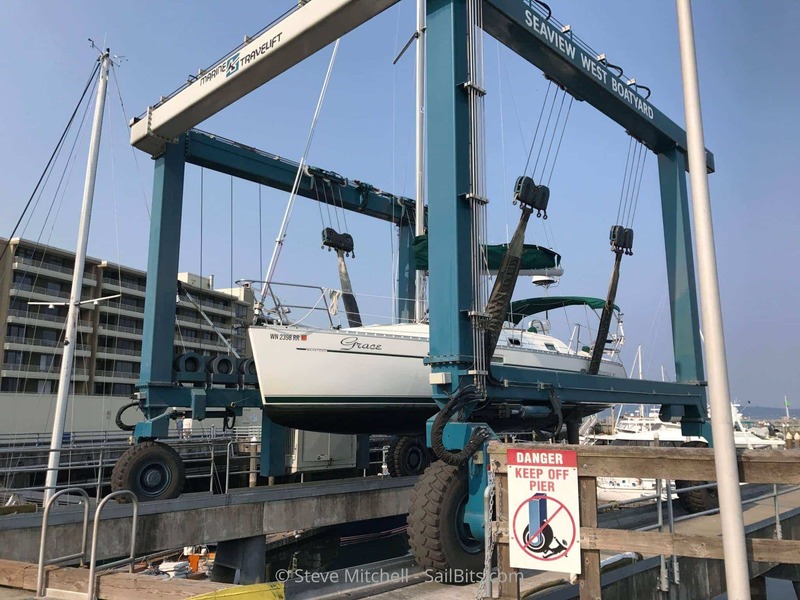 Seeing your 34 foot, 9000 pound boat fly around in the air is never a comfortable feeling, but the folks at Seaview kept her safe and really impressed with their professionalism. I had stopped coming to Seaview for years after having terrible experiences with the previous guy-in-charge. I can remember multiple times walking around Jammy and having him cite all the work that he thought should be done, getting into the $15-20k range, which was absurd since the boat was only worth about that much. Several friends had gone back in the last year and had great things to say about Seaview since that particular person retired, and they overall had stepped up their game. 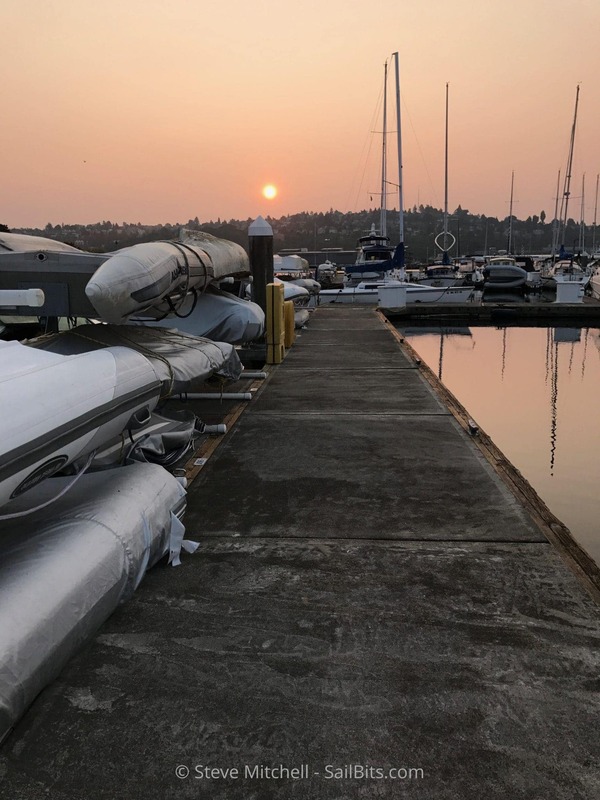 I had used CSR Marine a few times as well, but the hassle of dealing with a trip through the Ballard Locks on top of having stuff mucked about with the boat is nice to avoid. The bottom looked really, really good. Very little growth anywhere, a few barnacles in the places you would expect, but otherwise very good condition. 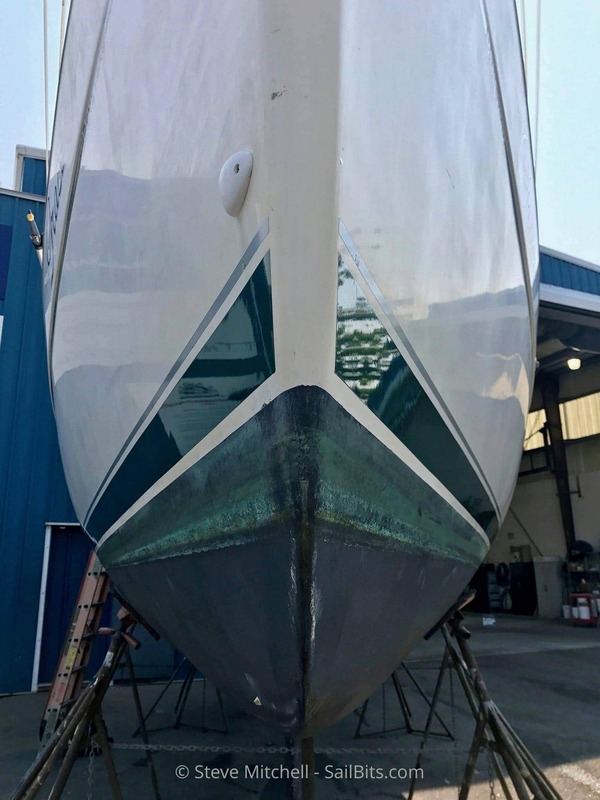 After chatting with Andy, my service guy, I chose to do one coat of Sea Hawk Cukote (what was used previously from what I can find), Propspeed on the prop, and a nice wash and wax for the hull. I was on a tight schedule of having her back in the water on the 16th at the latest, only about a week. With how busy their yard was, I was a bit worried, but they seemed confident they could turn it around that fast. I was very happy with how things looked on the bottom – I don’t ever seem to remember pulling a boat and not seeing at least something that made me unhappy. So far so good! After some master jockeying by the Travelift operator, Grace was plopped down right next to the main door into their paint building. Unfortunately due to the amount of people in the yard and my location, I would not have shore power, so I went about shutting down just about everything to conserve battery capacity so I could start my engine when I was back in the water. This is one of the downsides of having a single large battery bank, but I’m OK with the compromise. I also have a NOCO Genius Boost Sport GB20 400 Amp 12V UltraSafe Lithium Jump Starter which I keep charged and on board at all times, and have actually tested in a failure scenario. This gives me the ability to try almost 15 cold cranks of the engine to get things going – my trusty Yanmar never requires more than one though. I did leave my BoatCommand up and running with security sensors and such on, as I don’t trust boat yards for security. I also closed up everything, blanked out the windows and Zarcor doors, and removed everything of value from the cockpit. The largest amount of barnacles was on the keel, but even that was tiny compared to what I had seen on previous boats. Pretty easy to scrape, sand and paint back to perfect. The prop and related bits also had some growth on it, which is not unexpected. Every boat I have had ends up with a decent amount of sea life here. I found Propspeed about 8 years ago and had used it twice on Jammy with reasonable results. For the first 6 months or so I saw a good speed boost from having the prop polished to a shine and coated in Propspeed, and it seemed to slow growth on the prop. It is not as good as bottom paint, as it eventually is either overcome with growth or just gets flung off of the prop – I’m not sure which. Nevertheless, I feel like it is a good investment when hauling as it gives you just a bit more efficiency even for only a few months. 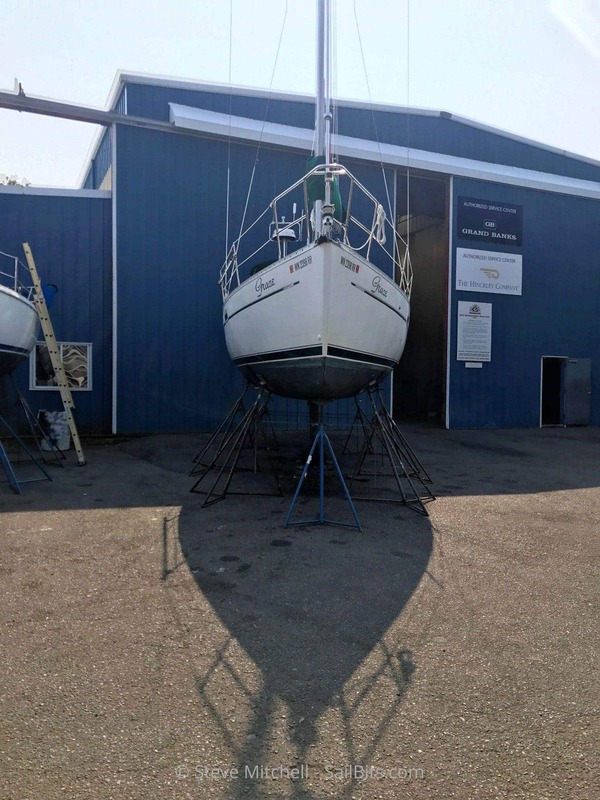 The other weird spot on this year of Beneteau is on the sugar scoop stern. 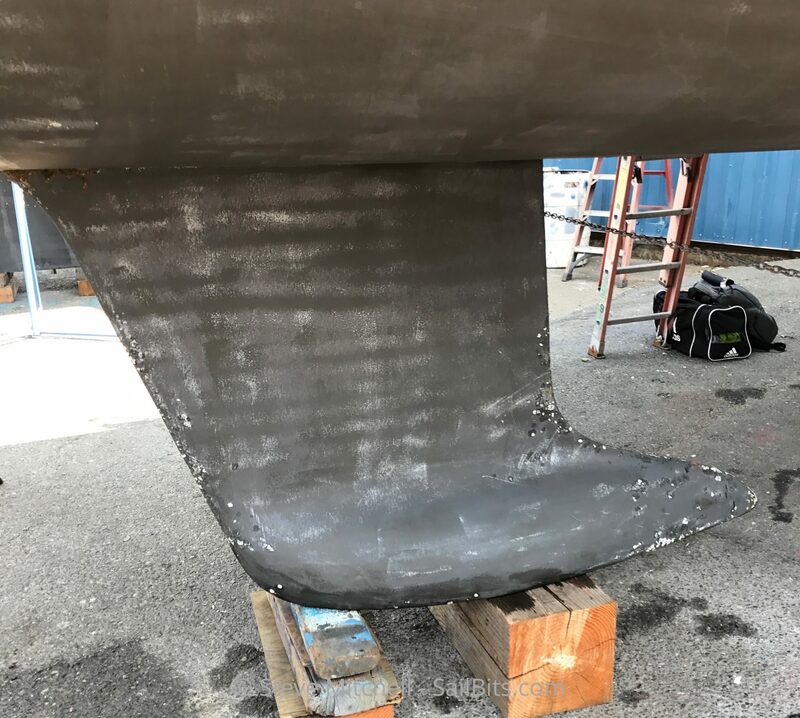 There’s a rubber bumper that surrounds the entire edge of the scoop part, including a part that is usually submerged depending on how much weight is in the boat, as well as whether we are underway – it dips under quite a bit while under motor. The alarming thing to me was that there was a ton of significant growth you could see from above for the last 6 months or so, and prompted me to make a haul out a priority. 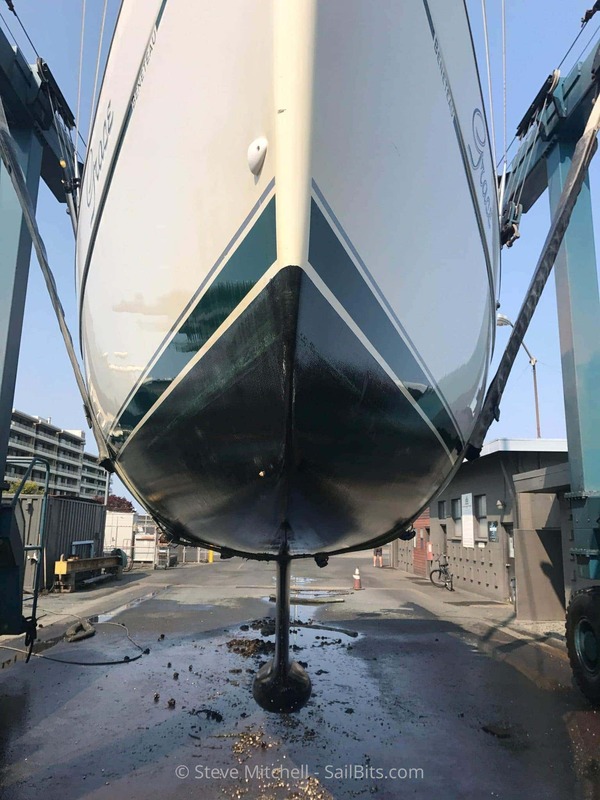 After getting her out of the water, I can see why so much growth happens here – there’s no bottom paint on the rubber, and I doubt it would stay on if you put some on anyhow. 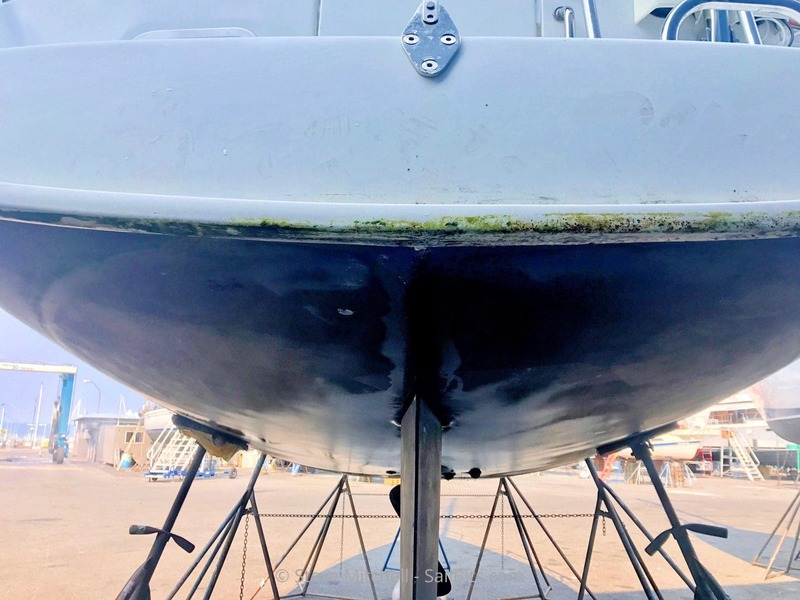 Lesson learned is to try to brush this when washing the topsides every time to keep growth to a minimum, and that growth here does not necessarily equal bottom growth. All in all a successful and uneventful haul out so far, with what looks like to be a pretty easy road to get her back in the water. I’m very happy with how little growth there is on the bottom, and how good all the through hulls and everything else look. 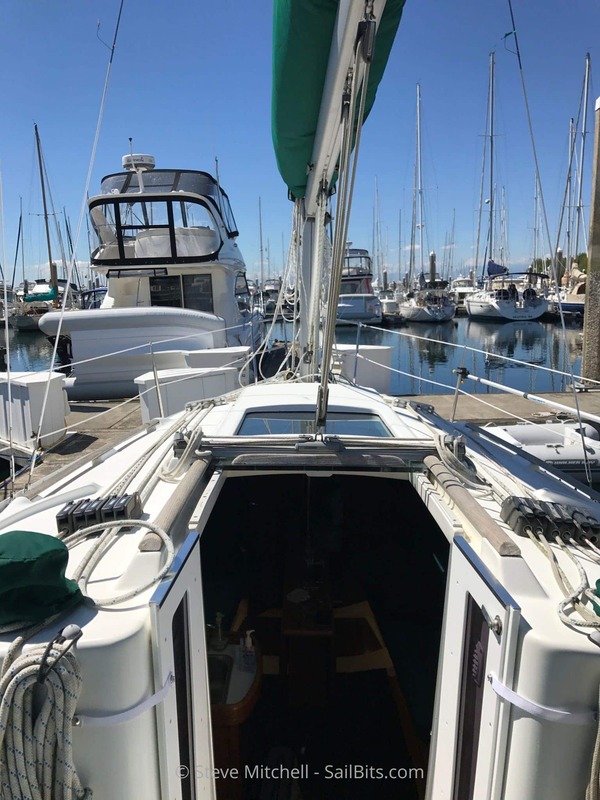 Now I wait for Seaview to finish their work, get her back in the water, and speed-provision things for the trip up to the San Juans!